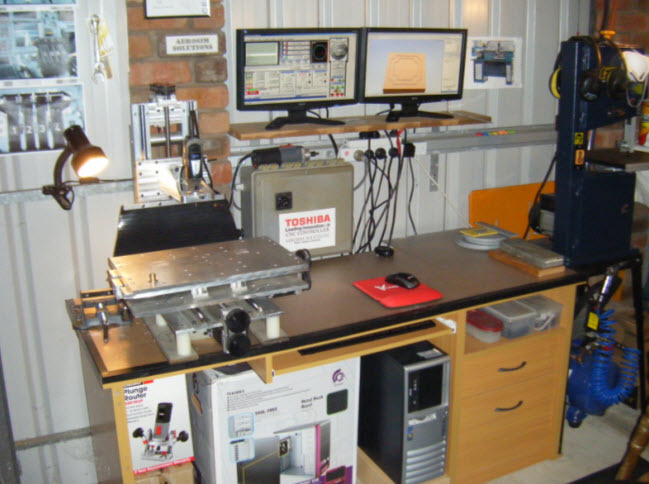 Hardware - Do I mention a CNC machine here or is that too obvious? I think you will really need one of those! A vertical bandsaw, table saw or jigsaw to cut out the raw materials required. A 3mm endmill and a 3mm 25 degree 0.5mm tip engraving tool. The material I use is 4.5mm thick Opal Acrylic sheeting, a 2.4m x 1.2m sheet cost me about AUD$130.00 so it is relatively cheap. To our U.S. friends, I’m sorry but I don’t do imperial measurements, I think my great grandfather did, I’ll let you calculate and perilously add your fractions! 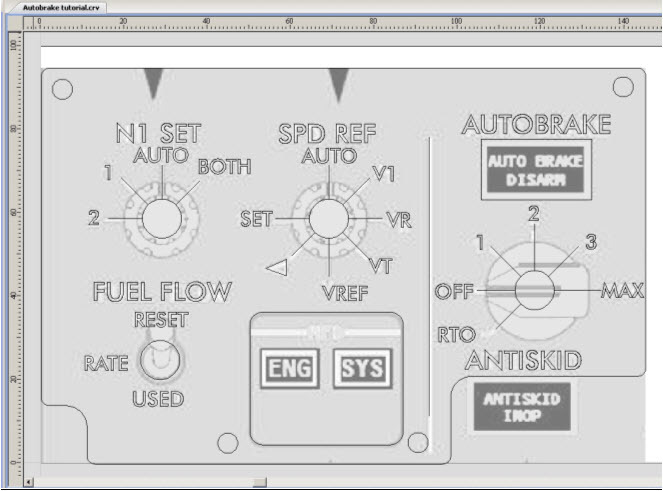 I highly recommend Vectric’s VCarvePro5.5, I have found it very easy to learn and it is a lot simpler to use than AutoCad and it quickly generates the G Code to drive the CNC machine. I use Mach 3 software with my machine and this is probably the most popular software for the hobbyist. 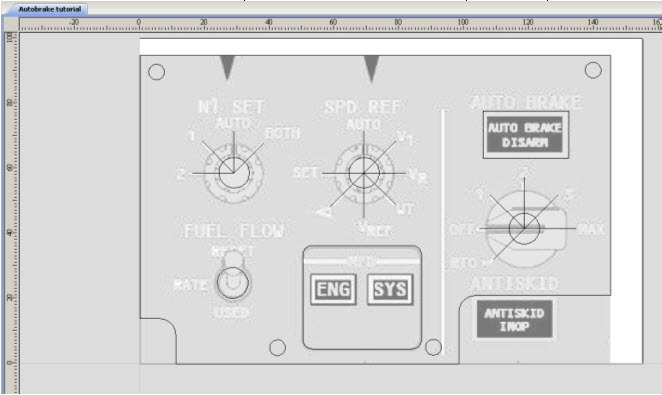 I have made a few good AutoCad drawings but I have found it quite a slow slog for the beginner, I plan to increase my skills in AutoCad as I believe it is still a very useful tool for the CNC machinist. 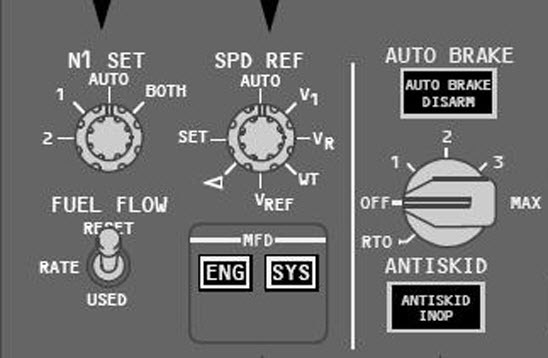 You will also need reference photos of the panels you wish to reproduce and I have used many screenshots from the B737 operations manual to produce my MIP set panels. I have used an epoxy enamel spray paint to paint the panels, it has a drying time of 6 hours but the tough high gloss finish is well worth the wait. I have used “White Knight” ‘machinery grey’, available at Bunnings for the local Aussies at $15.00 a can! It might not be Boeing RAL accurate but for this engineer with a purple/grey colour deficiency, it is definitely close enough! 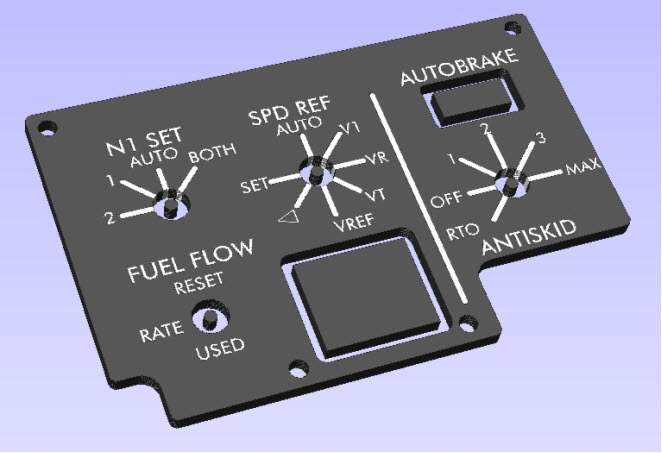 I will describe the process I use with VCarvePro software to produce an autobrake panel, the same process was used for each of my MIP panels. 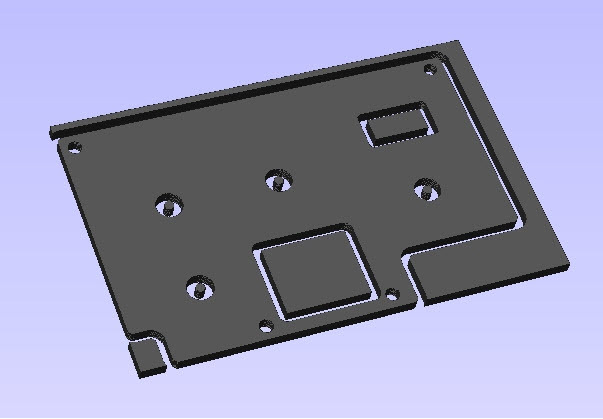 Step 2 Open VCarve and create a new file which is large enough to draw the autobrake panel on, I usually make the file about 10mm larger in width and height to accommodate the drawing. 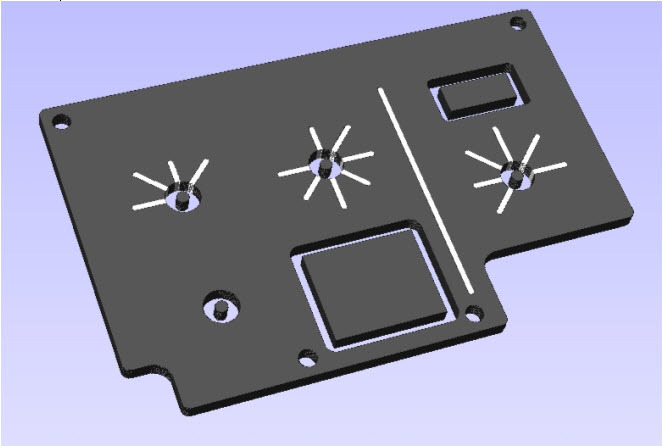 Use the bottom left hand corner of the panel for zero reference of the X & Y axis so when the Jpeg has been imported to VCarve, move it to align with the bottom left hand corner. 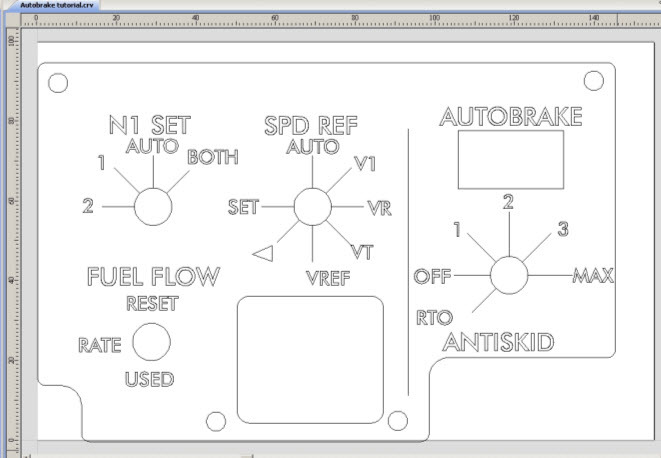 Note – VCarve has a really good image trace function that will create vectors but it can be messy, I prefer to hand draw the rectangles and plot the holes for creating toolpaths. I then use the scissor tool to cut away the lines inside the circles as they are not required. Step 6 – Remove the jpeg and create the toolpaths – see Fig. 7. 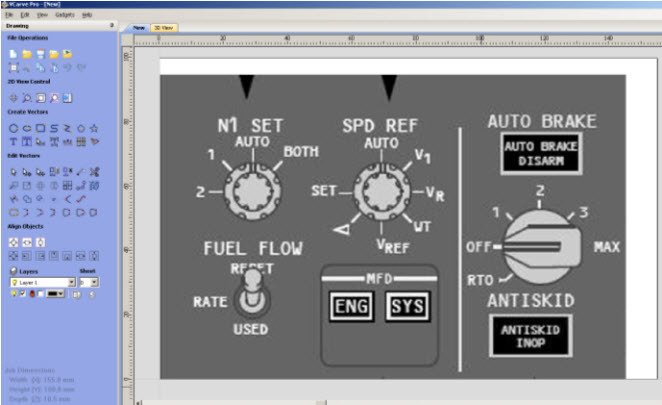 Vectric’s website has great videos showing how to create toolpaths, see www.vectric.com they explain it better than I can, it’s not hard! Step 7 – The fun bit, engraving the text and lines to bring the piece to life! First I will engrave the lines with a 1.5mm diameter endmill – See Fig. 9 VCarve has a button for deleting the waste material but it only deletes the outer waste. 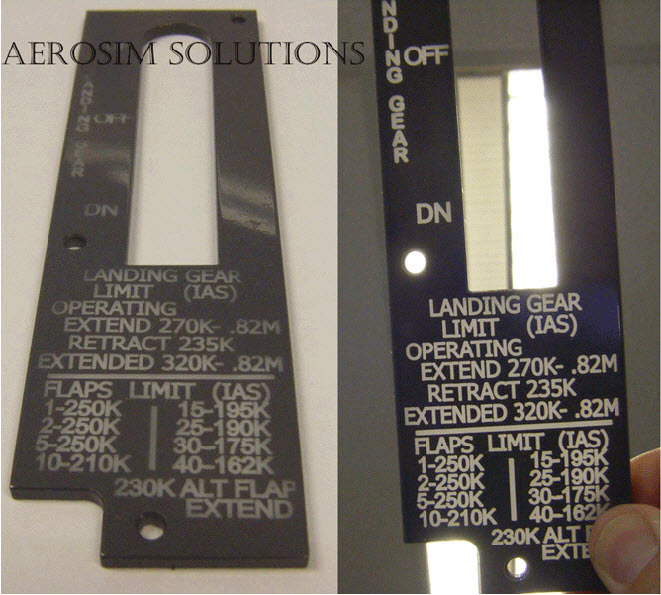 Step 8 – The text – I have been having good success with text using a 3mm diameter, 25 degree engraving tool with a 0.5mm tip. 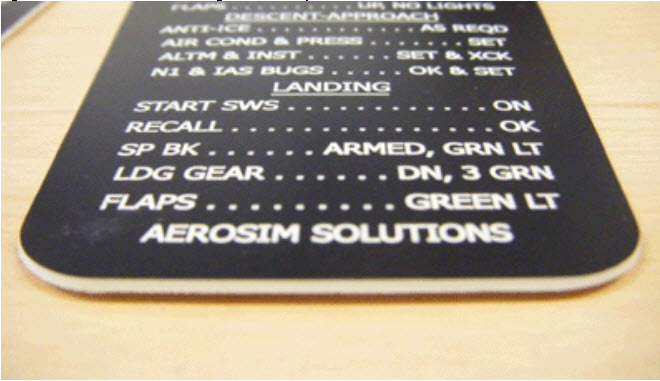 Figure 10 shows the preview image of the text engraved. 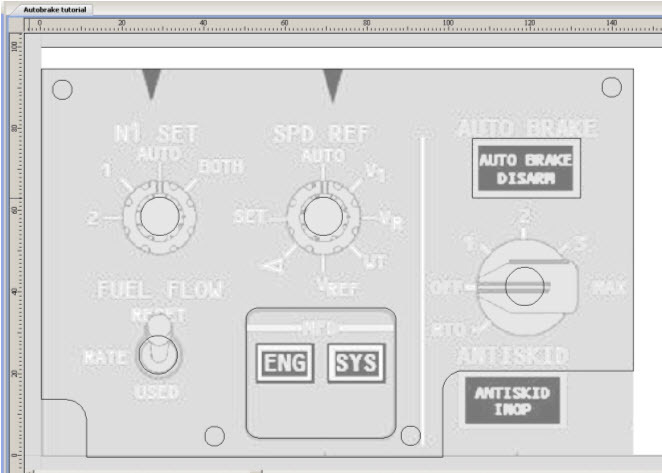 The small triangle on the SPD REF knob had to be a separate toolpath from the text but used the same tool. Fig. 11 - The end result and it backlights beautifully! I think it’s always a good idea to run the CNC machine around the outside of the work piece without actually cutting anything to make sure you can cut the material without hitting the hold down clamps or running off the edge of the workpiece etc. I’ve come unstuck a few times with errors like this and I think it is worth doing a ‘dummy run’ to reduce the possibility of breaking cutters and wasting materials! 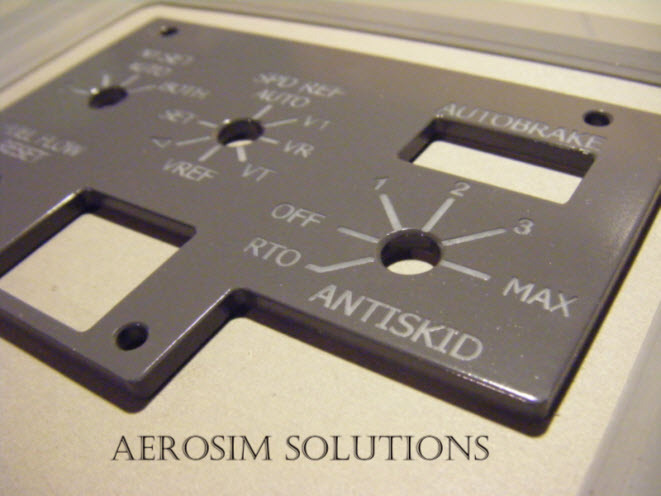 CNC machining has become a new hobby in itself and I’m looking forward to doing a lot more projects with my machine. It certainly is good fun and quite rewarding. I hope you find elements of this tutorial useful! I wish you the best of luck with your projects!